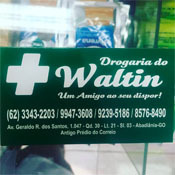 Farmacia do Waltim. We are a full service Pharmacy. We can deliver medications to your home or hotel, We apply injections and I.V.'s. Let us find your prescription for you. If we do not have it in stock we can get it to you within 24 hours. We also can help you procure medical equipment such as a hospital bed, Oxygen, wheelchairs, walkers, crutches, IV stand, bedpans, orthopedic equipment or any other piece of medical equipment you might need to rent or buy. Contact us before you get here so we can have things ready for you.